Happy Friday! and welcome to another Makeup 4 the Weekend challenge. 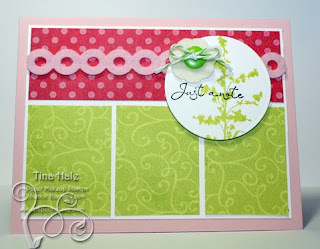 This weeks challenge hostess is the ever talented Tina Hale, and she's challenged us to use felt. Here is my sample using some felt flowers and my sentiment is from the Faith Hope Love set. And here is Tina's beautyusing "Just a Note"... just look at all those details! Gorgeousness!! Click on the Design Team member names to see some more eye candy & inspiration. So now it's your turn to get inky! Show us what you've got!!! Link up your card before midnight next Wednesday to be included in the Thursday Showoff. You don't have to use Paper Makeup Stamps, but if you've got them we'd LOVE to see them! Don't forget to mention the challenge in your blog post and if you post to SCS or PCP be sure to use M4TW35, so we drool over your artwork! Please remember to link directly to your challenge post. I admire so many of the DT's blogs on a regular basis. I'm so glad I was finally able to join in one of the challenges! Beautiful work & great challenge! !